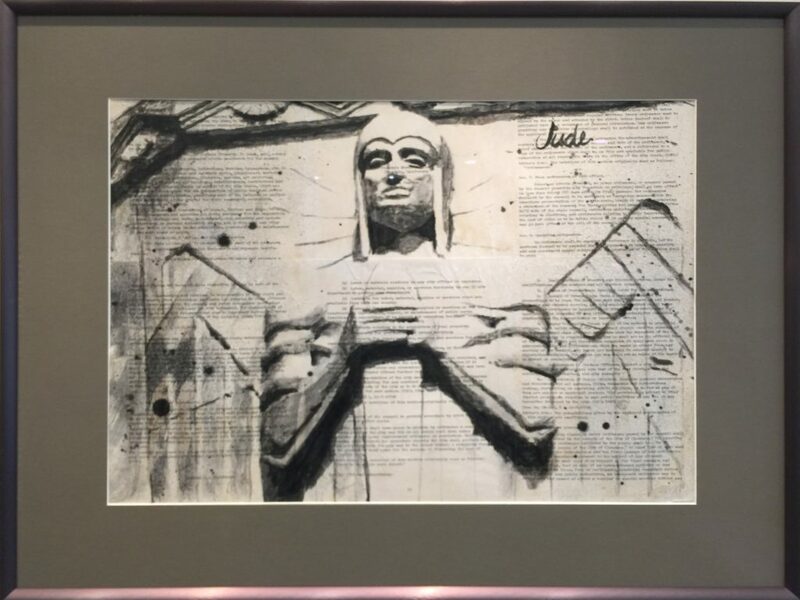 Description: This piece of artwork is a portrait of one of the winged sentries posted on the corner of the tower of the Grand Central Air Terminal. The guardian clutches an airplane propeller with eyes fixed on the horizon watching and waiting for something – perhaps the sound of engines and the glint of silver wings coming once more over Sonora Avenue. The piece uses pages from the Glendale California City Charter stained with coffee to give it a classic sepia tone aged look and feel. Classic techniques of painting, drawing, and ink washing are combine with contemporary artistic techniques of splatter and spray to produce the unique style. By using differing grades of ink, the subject looks almost three dimensional.